You know when your friends are going somewhere really good and you want to go too but can’t. And you jokingly ask “Can’t you just take me in your suitcase?” Well...that’s sort of what I asked of three of my fashion-forward designing American gal-pals -- Patti Carpenter, Kelli Ellis and Jaye Anne Mize -- who were all en route to Maison….Maison & Objet, the jewel of Paris Design Week. 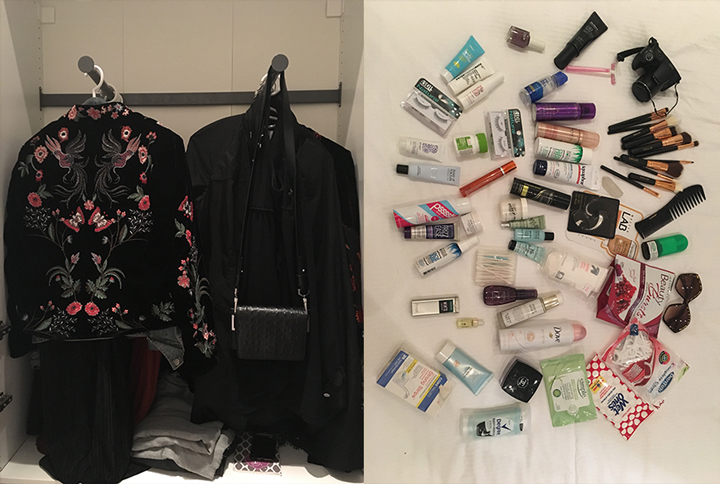 The next best thing to being toted along...I asked these three women, who thrive in the industry show environment, to kindly share what they had packed for Maison. With sleek platinum hair, big bold glasses, and bright red lips that always offer a big hello kiss and go with her red nails, Kelli’s high-contrast style is unmistakable. “I’ve got a basic uniform of a little sequins and a little fur in a sea of black,” says Kelli, describing her Maison suitcase. “I packed a new tube of Ruby Woo and my Hermes scarves to add that matching pop of color!” Fashion sneakers ensured all-day efficiency as Kelli cut a path leaving her scent, Girogio Armani’s Si, behind. Among her many accolades, Patti is a global trend ambassador and product designer. When packing for Paris, color and comfort were top of mind. “Those who know me know I LOVE accessories,” she says. “They make the outfit and provide that tasteful touch that defines my signature style.” Though eyeglasses and big rings are de rigeur with this globetrotter, this season it’s all about the bold necklace, collected from artisan projects around Africa. For Patti, style is important, but what tops that is style with substance. “When in Paris you must wear black but still stand out,” says Jaye, who cautiously integrated red and blush into her wardrobe this season. Her go-to black uniform got amped up from a dose of orientalia, fashion sneakers, the red lip and lush lashes. Her camera completed the look. Describing her shoes as “8 pairs of options” and toiletries as “my narcissistic tendencies at their finest”, Jaye always hopes to look semi-French so brands are nicer to her. Kelli, Patti, and Jaye appeared together on a panel at Maison. This highly observant, articulate, and creative crew talked about the connection between brand storytelling and consumer behavior in times described as the “experience economy.” With Jaye in mostly black, Patti in rich gold, and Kelli in a fun top with big sequin lips, their outfits complimented one another. Yet, panel moderator James Swan, with his smooth talk, was the ultimate compliment.